The Chatsworth traditional Grey back to wall cloakroom suite, Victorian inspired design with a modern twist. The Chatsworth range of charming bathroom furniture features classic styling with a satin Grey finish and tongue-and-groove side panelling. Manufactured to a high standard, the inspired Chatsworth range of luxury furniture with it's clean minimalist design and muted palette blends beautifully with any style of bathroom. It's compact size provides you with a handy space-saving solution for your cloakroom or en-suite. Internal shelf underneath the basin provides generous storage space for your toiletries, helping to keep your cloakroom clutter free. 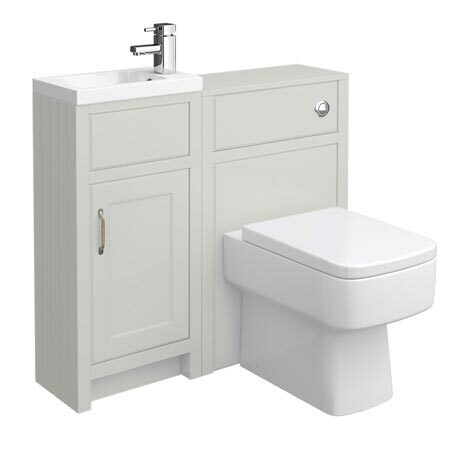 This traditional suite is perfect for smaller cloakrooms, totalling 900mm wide and the suite can be split up into a basin unit and toilet for those with awkwardly shaped cloakrooms.